If you are interested in grilling filet Mignon you have come to the right page! Grilling this wonderful cut of beef could be one of the easiest tasks you will undertake as a grill master. But be careful! This cut is the most luxurious cut of beef available and is commonly overcooked by grilling novices. 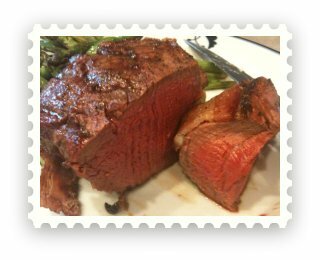 If you don't have a local butcher who can provide you with top notch filet Mignon, please visit OmahaSteaks.com, Inc. and give their world class steaks a try. They are a fantastic treat. The economic conditions of "supply / demand" apply to this cut. Each steer produces a mere four pounds of this succulent slice of heaven, which explains why it is so darn expensive. From a health standpoint, it is also one of the most sought after cuts of beef because it is very lean. I know what you are thinking. How can it be lean and so tender at the same time? The traditional way of serving this cut of beef is wrapping a thick piece of bacon around the steak prior to grilling. Make sure you remove the toothpick before serving it. Grilling filet Mignon is not tough. Give it a try! If you want to ask me a question about filet mignon, Click Here. Most of these points on grilling filet mignon are covered in my video below. I also talk about an easy technique I use to determine the "doneness" of the filet. Is doneness even a word? Cooking Temperature: Typically you will cook on medium high to high with this cut of meat, but please....make sure you let the cut come to room temperature prior to grilling. Get to Know a Good Butcher: There are so many options out there now. Introduce yourself to a butcher and don't be afraid to request special cuts. I usually get my filets cut to 1 1/2 inch. Don't Push on or Pierce the Meat: This may sound basic, but I can't tell you how many times I see this done. All you are doing is drying the meat out. Don't Over Cook: You can always put the steak back on the grill. You can't reverse the damages of overcooked meat. Don't Over Season: For this wonderful cut of meat, keep your seasoning simple. Kosher salt and freshly cracked pepper is sufficient. Let the Meat Rest : You must let the steak rest for ten minutes after removing from the grill. Otherwise when you cut into the steak, the juices will come flying out leaving you with a much drier cut of filet. This rule is applicable to all cuts of meat once grilled, other than fish.